I attend Ohio Northern University with a major in Mechanical Engineering, and an interest in robotics, specifically human-robot interaction. My expected graduation date is May 2012. 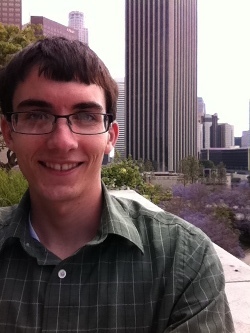 Currently, I am working the summer of 2011 in the Interaction Lab at the University of Southern California. The Interaction Lab, led by Principle Investigator Maja Mataric, works to create assistive interactive robots that can help people. During summer REU (Research Experience for Undergrads), funded by NSF, I will be working with Aaron St. Clair, on sheep herding task coordination between a human and the PR2 robot. I am current working on a human-robot task collaboration project. An overhead mounted projector will project images of objects (sheep) wandering for collection by a human and the PR2 robot. A second overhead projector will minimize shadows. The human will communicate with the PR2 using a laser pointer to indicate pointing gestures. This information is read by an overhead camera and relayed to the PR2. The PR2 must collaborate with the human to herd any wandering sheep back to the herd. With an overarching goal to build effective communication into a robot controller to complete ismple tasks alongside a human partner, this research specifically aims to improve "sheep herding" task collaboration. The goal of this research is to use the controller developed for the sheep herding taks for other tasks requiring collaboration. Both sheep and robot behaviors can be reused, update, or new behaviors added to the library and used for new task. The PR2 robot is used inside a small, curtain-enclosed pen. Sheep are projected on the floor of the pen using two cross-calibrated projectors. A human participating in the experiment can communicate with the robot using a laser pointer as a more accurate form of intrepreting pointing gestures. The robot controller in communication with the human will be compared to a simple state machine controller without communication, and with the human and robot performing the task alone. In order to test new sheep and robot behaviors, a simulation was needed. The ROS simulator stage was used to test new behaviors. The ROS package actionlib was used to create a server and client to call robot actions. The ROS package smach was used to create a simple state machine controller. Sheep initially start in a herd. They publish new position within the herd according to brownian motion and leave the herd randomly with poisson probability. To ensure the validity of experimental results, the sheep initialize in the same positions at the beginning of every simulation. Sheep reside in three different states: wander inside the herd, wander outside the herd, and collected. Sheep behaviors were written to allow the sheep to be "collected" by the robot and return upon arrival inside the herd. The sheep also avoid the robot, for aesthetics. Below is a video of the sheep avoidance behavior. As mentioned before, the sheep and robot behaviors are tested as shown in the ROS simulator stage. Each red and green coordinate frame respresents a sheep position, in this case 10 sheep in all. The red pentagon represents the robot's base. The video illustrates how the sheep move with brownian motion, but will never publish a position inside the robot's base, giving the appearance of avoiding the robot. This is especially effective when the robot is moving through a group of sheep. It is important to note that nine of the ten sheep are in the herd, and cannot publish positions outside of the herd, which is a small circle in the middle of the pen. The tenth sheep randomly wanders back into the herd at the end of the video. Robot behaviors were written using the ROS package actionlib. An action server is called by the controller with a specific action goal. This action server calls one of the action clients in the robot behavior library and returns true after the action is completed. Each action can be preempted if necessary, allowing for the robot to adapt to the human's intentions or sheep behavior easily. Below are a few videos of robot behaviors. As mentioned before, these behaviors are tested as shown in the ROS simulator stage. The first behavior shown is a simple "return to the herd center" behavior. The robot will return to the herd center, an action that is useful for returning a "collected" sheep to the herd center. The next video shows that the robot can "collect" sheep. Once any sheep that are outside the herd get within a close distance of the robot's "herding position," the sheep is switched to the collect state. The herding position is a frame slightly in front of the robot, so that the sheep can follow that frame and not appear to be run over by the robot. The following video illustrates collecting functionality, but a sheep is caught by steering the robot manually. 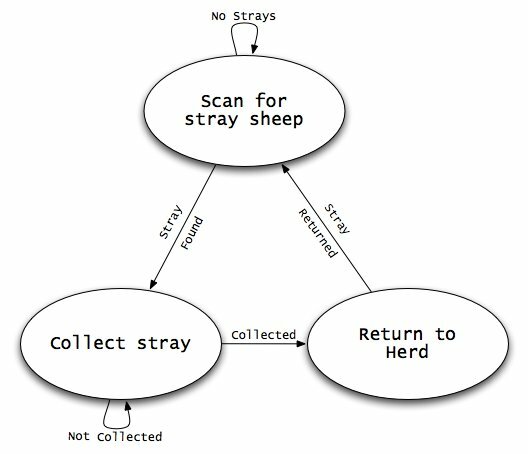 By adding a "collect nearest sheep" behavior to our return behavior we get a robot that can catch the nearest sheep and return it to the herd, where it is released. Note: These actions and any other robot actions are called by the overall controller with various parameters. Parameters can be changed according to the specific behavior. For example, the collect behavior can be parameterized in such a way to let the robot collect the nearest sheep, the furthest sheep, or a specific sheep. A simple state machine controller was programmed in order to compare the effectiveness of the task collaboration with no communication between the robot and the human. The flow chart to the right shows the state machine. The ROS package smach was used to build the state machine controller, and appropriate robot behavior actions were called within the controller, allowing the robot to continually collect sheep that wander outside the herd. This research is funded in part by the National Science Foundation Research Experience for Undergraduates program during the summer of 2011. A special thanks to the Computer Science department at University of Southern California for laboratory use and supplies. I'm interested in pursuing a PhD in human-robot interaction in the Fall of 2012. I have interests in entrepreneurship and product design as well. For more information about my strengths and interests, please visit my LinkedIn page here.